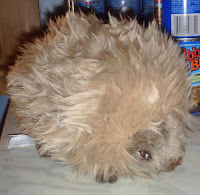 Instead of the Easter Bunny visiting a stuffed porcupine came to the cabin courtesy of Joe and Louise Zywiltis. 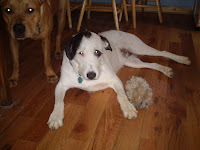 They thought maybe I could train the dogs not to go after real porcupines using this soft cuddly one. In reality this porcupine doesn't have the strong smell or annoying quills of the real porcupines. Scooter and Thor were not fooled. On the way home last night we saw 8 real porcupines traveling a mere six miles on the road. I suspect it is porcupine mating season. Of course I decided to get a picture of one after the eighth sighting and not a one showed up when the camera was ready. The porcupines are most active at night, but aren't apposed to showing up anytime of day as Jack and Leo both got quilled during early evening hours. May seemed to be the time Jack would find the baby porcupines and end up with a trip to the vet. Knock on wood, I am hoping to avoid the porcupine event this year by keeping the dogs in the fenced area during early evening and night hours. I am not ready to replace the Easter Bunny with a stuffed porcupine even if our chances of seeing a porcupine during Easter is much greater than seeing a rabbit. Have a quill free Easter. Mountain girl, Paula, logging off. We are still dealing with very cold temperatures. The changes from night to day were quite extreme the other day. We started the day at 18 degrees and by the afternoon it was 61. Forty three degrees of change in one day is quite amazing. The Flycatcher showed up on our porch yesterday and warns us that the barn swallows won't be far behind. Lee is planning to put the screens up on the porch ASAP to prevent the nesting. We took Scooter and Leo in for their annual heartworm checks and to our dismay Scooter was screened with Lyme disease, which they also check for. I wondered how this could be since I thought Scooter had a Lyme vaccination. Well, come to find out they had given Leo a Lymes shot and not Scooter. Scooter is taking antibiotics to get rid of the disease and we had to go get blood tests to make sure we don't have it. So heads up to hunters to check well for ticks and make sure your dogs are vaccinated for Lymes, since it is definately in our tick population. We have already pulled several off the dogs this year. Have a great Easter Weekend. Mountain girl, Paula, logging off. Well typical of April weather to remind us not to put our coats up yet. 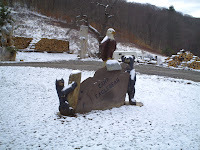 Looks like we are getting a dusting of snow for the next couple days. And the warm days of April have been put on hold for another week. The only good thing about April snow is you know it can't hang long. 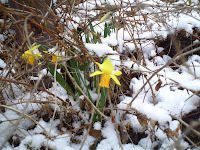 The daffodils had just made it up in time to greet the snow and the crocus are not far behind. The tom turkeys have been strutting their stuff this last week and today Scooter gave chase to a large tom down by the Hooke camp. I think he had more fun chasing the bird then the bird had getting away. I also saw a large groundhog hiding under Brad's outbuilding in Cedar Run today. Thor took a look a bit late to see the the groundhog, but tracked it down to under the building. He stuck his nose under hoping to get a better sniff. Luckily the groundhog stayed far away. We used to have a lot of groundhogs up here, but haven't seen many in the last 15 years. Some people think the coyotes have ate them all. I am sure the bobcat family we have close had a hand in the groundhog's population decline as well. The creeks are running clean and strong and there is nothing like that soothing sound when I am working. I don't dare sit down and listen long or I would be done working for the day. I feel lucky to have such a pleasant working environment. Have a great Leetonia day! Mountain girl, Paula, logging out.